After aggregate is placed on the asphalt, rollers orient the aggregate in its flattest dimension and seat it firmly into the asphalt binder. A pneumatic roller is recommended for all seal coat and surface treatment work. A steel-wheeled roller is not recommended because the flat, steel drum will tend to crush the aggregate, especially on the high spots. This is particularly true when lightweight aggregate is used. In addition, if the old pavement is rutted, a steel-wheeled roller will tend to bridge over the ruts failing to seat the aggregate firmly in the low spots of the wheel paths. The manufacturer’s name (or brand name), model number, and serial number of all rollers used on the project should be recorded. Manufacturers publish the gross weights of their product with water and wet sand as ballast. If either of these materials is used and the ballast tanks are full, the inspector can safely certify whether or not it meets the weight requirements. If, however, the contractor uses another material, such as aggregate for ballast, it may be difficult to determine if the rollers meet the weight requirements. When in doubt, the contractor should be required to have the rollers weighed. A weight ticket should be obtained with a certified vehicle weight and included in the project folder. Pneumatic rollers operate on rubber, air-inflated (pneumatic) tires. Figure 7-39 shows a pneumatic roller typical of those used for seal coat and surface treatment work. 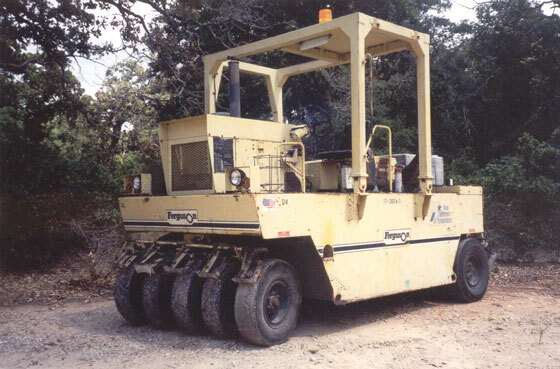 All pneumatic rollers must be self-propelled and capable of operating in both forward and reverse. Weight. Many project plans will call for light pneumatic rollers which are described in Standard Specifications Item 210, Rolling. This item requires that a light pneumatic roller be capable of ballast loading, to uniformly vary the total vehicle weight from 9000 pounds to 18,000 pounds. Wet sand or aggregate may be used for ballast. Item 210 requires a minimum contact pressure of 45 pounds per square inch (psi) of tire contact area, as a minimum for the light pneumatic-tire roller. All tires must be smooth surfaced as shown in Figure 7-40. Figure 7-45. Smooth-Surfaced Pneumatic Tire. Tire Inflation. The roller shall provide a uniform compression under all wheels. Specifications require that all tires be inflated so that there is not more than 5 psi variation within all tires. Correct tire pressure is very important. If one tire is soft, it will not seat the aggregate as firmly as the other tires, and this could result in the aggregate in that path stripping away under traffic. Appendix C of this Manual contains a tire inflation chart. This chart provides tire pressures for all commonly used tire sizes and ply ratings. Number of Tires. Specifications require that light pneumatic rollers have a minimum of nine tires. Most are manufactured with five wheels on the front and four on the rear. The rear wheels are the drive wheels; the front wheels are the steering mechanism. Area of Coverage. Light rollers are required to cover an area approximately 60 inches wide on each pass. The rear tires must be offset to provide coverage of the areas between the front wheels as shown in Figure 7-41. Figure 7-46. Wheel Configuration on Pneumatic Rollers. Wheel Wobble. The wheels must not wobble when the roller is in operation. This can cause aggregate to be displaced. If any wheel is not operating smoothly, the roller should not be allowed to continue operation. Free of Leaks. Like all other pieces of equipment on any construction project, rollers must not leak engine coolant, fuel, hydraulic fluid, or anything else that might contaminate the asphalt binder or aggregate. If any leaks are detected, the roller must immediately be removed from the project. Smooth Operation. All rollers must be capable of smooth operation, especially when turning, stopping, or starting. If the brakes or drive train are faulty and cause jerking or excessive vibration when the roller is stopped or started, it should not be allowed to continue operation. 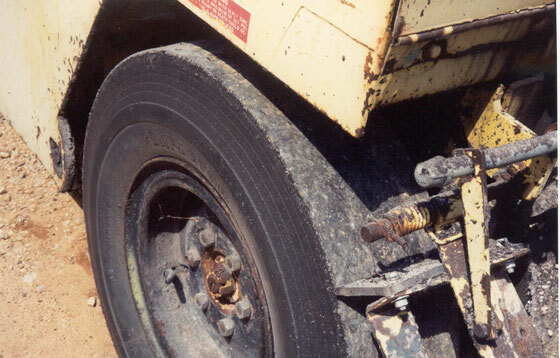 If one of the wheels is out of alignment, it may cause “scuffing.” None of these conditions should be permitted on the job. Medium-Weight Rollers. Medium pneumatic rollers may be used on some projects. The information given for light pneumatics is also true for medium-weight rollers, with the exception of the weight, number of wheels, contact pressure, and width. Medium rollers must be capable of varying the weight, by adding ballast, from 23,500 pounds to 50,000 pounds. There must be no less than seven wheels, with contact pressure of 80 pounds per square inch (psi) or more. The effective rolling width should be approximately 84 inches. Tire Pressure. Tire pressure is probably the most critical inspection point for pneumatic rollers. The variation in the pressure cannot exceed 5 psi within the group of tires. Required ground contact pressure, as specified in Item 213.2. For light pneumatic rollers, contact pressure of 45 psi is required. For medium (Type A), 80 psi is required; for medium (Type B), 90 psi. These are the minimum amounts; higher contact pressures are allowed. Assume that you are inspecting a light pneumatic roller. You have a certified weight ticket showing the gross weight of the roller as 17,700 pounds. It is a nine-wheeled roller. The tires are 7.50 x 15, 6 ply. Standard Specifications call for a minimum of 45 psi contact pressure per wheel. First divide the number of wheels into the gross vehicle weight, to determine the weight on each tire (wheel load). Next, turn to the Pneumatic Tire Pressure Table in Appendix C. Look in the left-hand column which gives tire size and ply. Find the block that applies to 7.50 x 15, 6 ply tires. The next column gives wheel load. Since the blocks are broken down into 250 pound increments, the chart shows 1750, then 2000 pound wheel loads. Since the 1750 block is less than the 1967 pound wheel load on our roller, go to the 2000 pound block. The next column to the right is Inflation Pressure. Skip over this column and go to the one titled Contact Pressure. The Specifications call for a minimum of 45 psi Contact Pressure. Again, there is a division of only 43 and 46 psi, so you must use the higher number. Reading back to the left one column (Inflation Pressure), you find that 40 psi is the minimum inflation pressure for the tire sizes used on our example. Check overall condition of the equipment. Check for presence of leaks of any kind. Tires should be smooth (no tread pattern). All tires should be the same size and ply rating. The roller must be self-propelled and operate in both forward and reverse. There should be no wheel wobble, since this will scuff the cover aggregate. Check tire stability on turns. If there is unusual scuffing, it may mean a bad bearing or king pin, which might not be detectable when the roller is moving in a straight line. Roller tires should have no gouges that would alter the contact pressure of the tire.